This post originally appeared in Medium. Having a data-driven foundation is profoundly important when it comes to making informed business decisions. But what restaurant manager in their right mind would spend time and money extensively tracking data and performing analytics when they have to constantly be on top of managing their staff, ordering supplies, maintaining customer satisfaction, and keeping track of the thousands of other tiny details necessary to run a successful restaurant? But what if analysis could be easy? There are numerous complex interactions and relationships intertwined amongst each source, and there are often quite a few more sources than those listed. This allows for in-depth exploration of all kinds, so someone should be analyzing this, right? What concrete benefits are we seeing from running our specials/promotions? What times of day can we adjust staffing based on traffic? Why are we always missing so many cucumbers? The benefits of visual analytics across any industry are real, tangible, and well-documented (a great breakdown of the advantages of visualizing data can be found here). 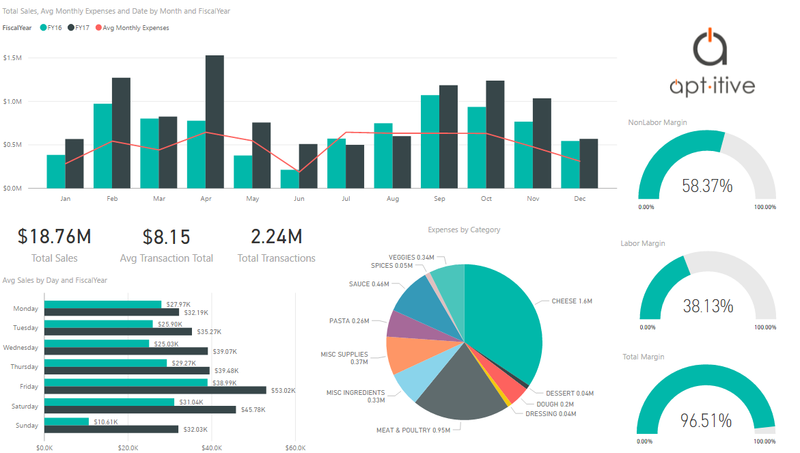 This and each other screenshot are taken from Microsoft Power BI dashboards created by Aptitive. 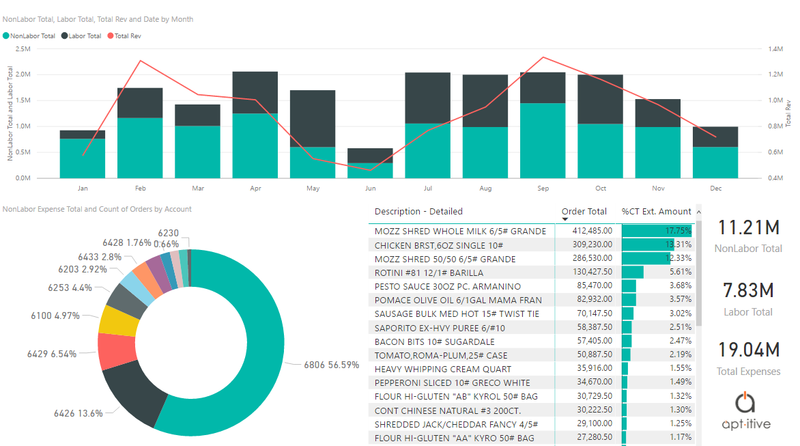 Once an analytics dashboard has been implemented, there is no need for any more time spent in Excel trying to perform calculations on aggregate totals from disparate sales and ordering spreadsheets (or by doing math with a pen and paper). An executive, interactive dashboard answers every high-level question right off the bat, allowing for a bird’s eye view of the whole business at a glance. 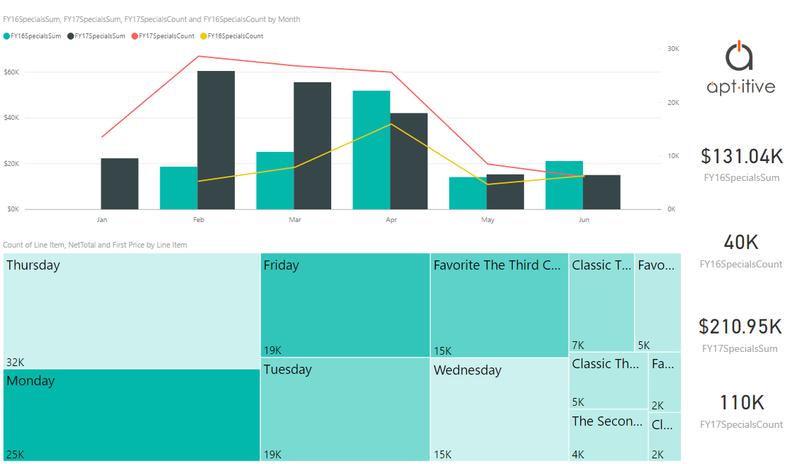 The particular visualization tool used here, Microsoft Power BI, is highly interactive — every graph and summary statistic on the page can be cross-filtered and “drilled down” into at will (‘drilled down’ essentially meaning exploring a finer level of detail, such as going from a whole month to each week in that month). Ever wonder where the the money spent on ordering supplies is really going? A custom-built dashboard can be tailor-fit to show margins and track totals for any expenses paid out to any specific suppliers. Some of the most pervasive and elusive problems to solve relate to the effectiveness of specific menu items. “Are my specials worth it?” “Are my menu items profitable? 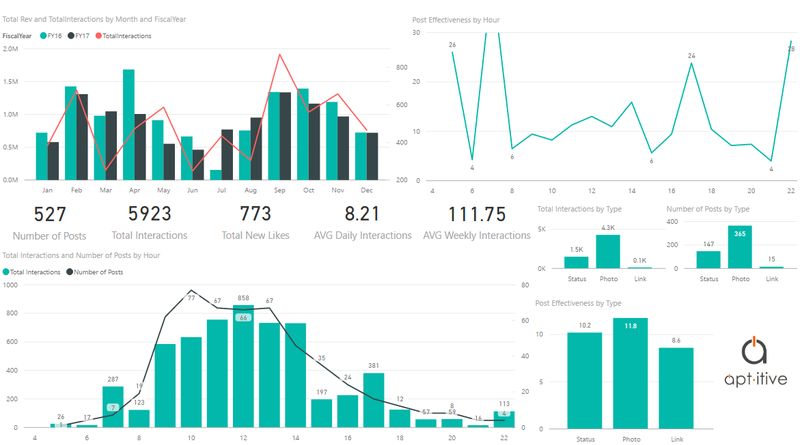 Are they popular enough?” Dashboards provide the otherwise inaccessible tools that are necessary to answer these questions. Facebook’s analytical features are helpful, but very limited in their functionalities. However, the data can be exported and loaded into a BI tool to implement into a dashboard. Among other analyses, with this data it’s possible to get a sense of how effective which types of posts are, at any specific time of day. There are many additional analyses that aren’t included in the examples in this article, such as pricing, inventory tracking, the impact of employee discounts, seasonality studies, sales prediction capabilities, etc. However, maybe the most attractive part of any dashboard isn’t necessarily the insight it allows for right away, but the potential for continued areas of exploration and discovery as time progresses. Being able to visually see the data from all facets of your business operations at once with a custom-built dashboard makes it incredibly easy to find the answers to almost any business question. There is plentiful ROI — you may even be able to find out that it really has been Jeff stealing cucumbers this whole time. Invest in one, and welcome your restaurant to the modern age of analytics.